This year‘s rainy season has brought tears and sorrows for many communities in the northern part of the country as they were ravaged by flood which accompanied the rains. In Jigawa state, flood claimed the lives of seven persons and destroyed 50,000 farmlands and 2,000 houses. The communities affected include Dabi, Ibawa, Algama, Laura, Kayi hawa, Dingare,Siyanku,Nsukum, Zangon Kanya among others, all from the six electoral wards of Ringim, Kyarama, Dabi, Sintilmawa, Yan-Dutse, and Chai-Chai Sabuwa in Ringim Local Government Area. One of the victims who spoke with Vanguard, Inusa Rabiu of Dabi town said that the disaster had left thousands of people homeless. According to him most of the affected residents had moved to their friends and relations’ houses in the area which were not affected by the flood and appealed to the authorities concerned to come to the rescue of the victims by relocating them to temporary site. Another victim from Algama village, Malam Musa said that he lost his house and some of his belongings to the flood while his farmland also perished. Chairman of the council, Alhaji AbdulRasheed Illa who confirmed the incident told Vanguard no fewer than seven people died in the flood and over 2,000 houses destroyed while 50,000 farmlands were submerged in Ringim local government area of Jigawa state. Abdulrasheed Illah stated that “some of the deceased lost their lives when the canoe they were using to convey them to other places capsized while some of the deceased died in their homes as others died on their way trying to cross the river. “Apart from the residential houses destroyed by the flood, government and public buildings were also affected which include schools, hospitals, markets and mosques. The flood also destroyed farm produce such as guinea-corn, rice, groundnut, millet and other cash crops worth millions of naira include”, he added. He however explained that the local government had purchased fifty trucks of sand and six thousand empty bags to construct an embankment around the affected areas and urged both the State and National Emergency Management Agency to intervene and assist the affected victims of the flood. Also in Kogi state, no fewer than 64 communities have been submerged by flood in the Kogi/Kotonkarfe Local Government Area of Kogi. Mr James Ahmadu, Director of Relief and Rehabilitation of the Kogi State Emergency Management Agency, made the disclosure on Thursday at Edeha community in Kotonkarfe. He spoke to newsmen after visiting one of the IDPs’ Camps in Edeha community, saying that more than 150 households had been trapped by flooding in the past three days. Ahmadu said that a man, popularly known as “Ibrahim Barrister” lost his life to the flooding while trying to move upland. “We are here for on-the-spot assessment of the flooding situation in Kotonkarfe. As you can see everywhere is flooded. Over 64 communities were submerged. Five temporary camps have been set up for the victims by the state in collaboration with the local government, that is why NEMA is here for assessment of the situation. We thank God that NEMA is here and they are cooperating with the state government in ensuring that necessary arrangement is made.” Ahmadu said. Mr Bitrus Samuel, Head of Operations at NEMA Headquarters, represented by Mr Reubean Babatunde of the Abuja Operations Office of NEMA said that NEMA was in Kogi to assess the extent of damage caused by the flooding. “We were told there are five different IDPs Camps in Kotokarfe. We are in the first camp in Edeha community to see the displaced persons and get their data, take it back to Abuja, to see what NEMA can do to assist them. The local government official said that about 30 of the communities were submerged on Sept. 3 and another 34 on Sept. 4, making 64 villages submerged as at now. “This is a natural disaster but NEMA would do its best to respond as fast as we can to ensure that those people who are trapped are rescued. “We are doing on-the-spot assessments, but we are still appealing to people living in flood-prone areas in the state to relocate to the upland,” Samuel said. Mr Yakubu Mohammed, the PRO/Desk Officer on Ecology of the Kotonkarfe Local Government Council, told reporters that residents started experiencing flooding a few days ago. He named some of the submerged communities as Akpaku, Akpo, Ajara, Banda, Kpakpasu, Ozale, Opkakere, Agbawu and Adabode, among others. 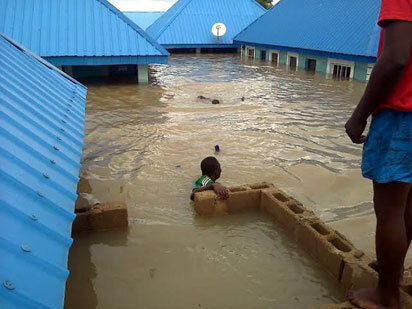 Similarly, the National Emergency Management Agency (NEMA) has said that over 5,000 households in16 local governments of Sokoto, Kebbi and Zamfara States have been affected by flood in this year’s rainy season. with the theme: “Repositioning, Restructuring and Re-orientation of NEMA Staff and Operations”. Muhammad said that the affected local government areas were: Sabon-Birni, Kebbe, Tangaza, Goronyo, Wamakko and Illela in Sokoto State; and Argungu, Maiyama, Birnin-Kebbi, Shanga, Bunza and Danko Wasagu in Kebbi State. He said that Maru, Tsafe and some parts of Gusau Local Government were affected in Zamfara. “We have already conducted an assessment of over 5,000 houses that were affected by the disaster in these LGAs. We have forwarded the record to our headquarters in Abuja for relief assistance,” he said. The coordinator urged the general public to always adhere to signals, warnings and predictions on flood disasters given by the Nigerian Metrological Agency (NIMET). “You know that every year around March, the NIMET normally issues annual rainfall predictions and give information on likely flood-prone areas. Also NEMA sensitises all stakeholders every year, particularly the states and local governments. We are calling on members of the public to always comply with the information, warnings and signals to avoid and prevent flood disasters in the society,” he added. Meanwhile, Governor Abubakar Bello of Niger state on Thursday approved the release of over N60 million for provision of relief materials for victims of flood in Mokwa Local Government Area of the state. He gave the approval when delegates from the communities submerged by flood visited him to solicit government assistance. The News Agency of Nigeria (NAN) reports that the delegation led by Alhaji Ibrahim Yawa had appealed to the governor to come to the aid of the victims who had been rendered homeless in the area. Yawa disclosed that over 30 communities in Mokwa Local Government area were submerged by flood, and that the farmlands, livestock and houses were destroyed. The governor directed the state commissioner for finance to release the money with immediate effect to the state Emergency Management Agency (NSEMA) for relief materials for the victims. He said the relief materials such as rice, maize, clothing, oil and other essentials should be provided for victims to ease their suffering and directed that the affected communities should be moved to a new location for safety of their lives and property.